Does Planck 2013 Data hurt the continuance of geometrical underpinnings? WEll, some of the commentors like myself are not worth counting? :)Thanks for keeping it interesting Clifford of Asymptotia. I hope you won't mind the following quotes for consideration. ( it was considered spam) so I reprint it here. Is there not some way presented by Susskind which can help one approach understanding of what is going on in the blackhole by incorporating his "thought experiment" in relation to the entanglement process? So of course questions about "the horizon" are interesting. 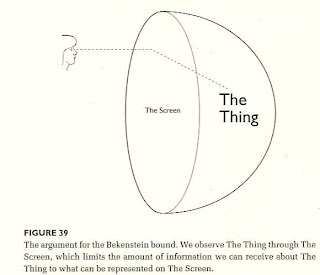 So we have these diagrams and thought processes developed from individuals like Jacob D. Bekenstein to help us visualize what is taking place. Gives us key indicators of the valuation needed, in order to determine what maths are going to be used? In this case the subject of Conformal Field Theory makes itself known, for the thought process? So we are given the label in which to speak about the holographic notions of what is being talked about in the case of the blackhole's horizon. This year marks the hundredth anniversary of Einstein's "miraculous year", 1905, when he formulated special relativity, and explained the origin of the black body spectrum and Brownian motion. In honor of this occasion, I will describe the modern view of spacetime. After reviewing the properties of spacetime in general relativity, I will provide an overview of the nature of spacetime emerging from string theory. This is radically different from relativity. At a perturbative level, the spacetime metric appears as ``coupling constants" in a two-dimensional quantum field theory. Nonperturbatively (with certain boundary conditions), spacetime is not fundamental but must be reconstructed from a holographic, dual theory. 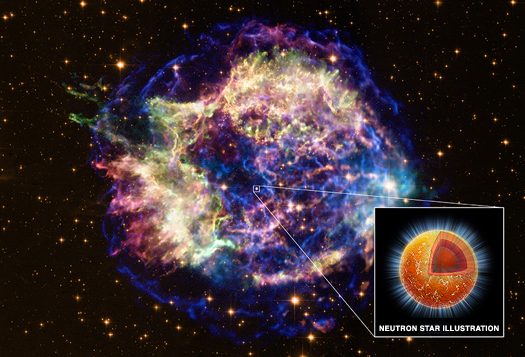 I will conclude with some recent ideas about the big bang arising from string theory. With such a statement, the "purity of thought," is speaking to a much more schematic understanding as we discuss the sociological thinking of mathematicians and the worlds they fantasize about? While deeper in reality the thought process(meditative) was engaged at a very subtle level, associated with the energy all pervasive. Another wonderful spin-off is that it turns out that the charge of the electron is related to the radius of the little circle. This should not be surprizing: If the electric field is just a manifestation of geometry, the electric charge should be, too. In "Star Shine," we start from a very large circle, but there is much to see from this circle, when we consider it's radius. We think "continuity" is somehow not involved, if we freeze this circle, and call it a discrete measure of the universe's age? Yet we know to well that the motivation of this universe from a "distant point" measure today entropically lives in the multitude of complexities? Model apprehension is part of the convergence that Lee Smolin and Brian Greene talk about, and without it, how could we look at nature and never consider that Einstein's world is a much more dynamical one then we had first learned from the lessons GR supplied, about gravity in our world? Unfortunately, Einstein and the other enthusiasts were wrong. As with Nordstrom's theory, the idea of unification by adding a hidden dimension failed. It is important to understand why. If all one had was the "cosmological view" one could be very happy about the way in which his observations have been deduced from the measures of our mechanical means, that we say that GR is very well suited. Yet it has been through th efforts of reductionism that we have said, "hey there is indeed more depth to the views we have, that the mechanical measures are being tuned accordingly?" While energy is being exemplified according to the nature of the particles we see in calorimetric design, what said that the energy here is not topologically smooth in it's orientations? Even we we move our views to the quantum regime. Maybe having solved the "Continuum Hypothesis," we learned much about Einstein's inclinations? Even Einstein had to add the "extra dimension" so we understood what non-euclidean views meant in a geometrical sense. I again refer here to Klein's Ordering of Geometries so one understands the schematics and evolution of that geometry. The Spacetime Fabric, "is" the Fifth dimension. Now of course, how do such assumptions make their way into my thinking and visualizations that I do? The seeing, of what mathematics and it's symbology had done for those who might see the geometry of expression, as a very vital way of thinking in the abstract world of mind, analogous, to the computer screen in front of us? Similarly, in general relativity, the fourth dimension is manifested in observable three dimensions as the curvature of path of a moving infinitesimal (test) particle. 't Hooft has speculated that the fifth dimension is really the spacetime fabric. Linked paragraph above was pointed out to a link you to further thoughts on this. It was a strange revelation of sorts to think that such a process could lead you to such thinking, as well, as leading one to understand how General Relativity becomes a result of of String theory. It just made so much sense as I watched this developement take place in this geometrical extension of thought, that to a beginning, from a point to a line to a plane, was raised in mind, as a short cut to the brane world understandings. I really do not undertsand how I made this jump, but never the less, it took me to a fifth dimensional referencing. The work of Banchoff helped in this understanding. In using image production, our 2d computer screens, as example, shows the work we are doing in the abstract space of mind. While I am still ever the student, such thinking moved from the ideas of General Relativity, and it's geoemtrical nature, moves one into the dynamical regions of thought. Held, in regards to those curvatures. I just tend to see them in this way after understanding the "geometrical nature." So too, the undertanding of General Relativity means, and in this assumption, "gravity" becomes the terminology that I see in the dynamcis of that universe. Can I help seeing the thought of humanity so capable in the mind, to relate choices to the heart and the feather weighting truth, that I also had come to see the gravity of that situation? IN such thoughts, Einsteins analogy of the Pretty girl always come to mind. It was a conceptual leap of sorts, as well as beautifully laid out model of GR as to our understanding in terms of what gravity means. From strong to weak, and all the understanding of the place, where a flat plane of which no gravity exists, is a place where such transitions take place in my mind. Is this true or not? The very thinking of brane developement lead me to think in a 2 dimensional framework, yet I am well aware of the fifth dimensional views that this framework supplies. Is it wrong? I would have to rely on competent readers of the Brane world to have them say ye or nay, as to the thoughts being portrayed here. In physics and mathematics, a sequence of N numbers can be understood to represent a location in an N-dimensional space. When N=5, one of these numbers is sometimes colloquially called the fifth dimension. This usage may occur in casual discussions about the fourth dimension, which, in the context of physics, refers to time, coming after the first three spatial dimensions (up/down, left/right and forwards/backwards). Abstract five-dimensional space occurs frequently in mathematics, and is a perfectly legitimate construct. Whether or not the real universe in which we live is somehow five-dimensional is a topic that is debated and explored in several branches of physics, including astrophysics and particle physics. The extensions beyond what we had always taken for meaning as "seeing," is the undertanding that all 3 space coordinated directions with time, are embedded in some "design" beyond that frame of reference held to General Relativity. If it wasn't, how could anything working beyond this, be found as a coordinated result? It is most certain that at this point the public would have been left behind, so is there a way to bring perspective at this point on where you are now? 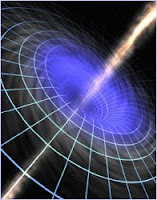 I recognize the generalization and roads that lead to blackhole as a basis for considerations. What would draw ones atyemtion to this horizon. Lee Smolin in his book gave adequate discription that I just pointed out here. I know it might seem that if this conversation is now highlighting the intricacies of blackhole dynamics, then what exactly are you doing? By giving a visual map of the Bekenstein Bound this help to direct my attention to the mapping that had been going on theorectically here. Mine would definitiely be generalizations, but work by others lead to deeper insights. So what "tidbits" had already been out there then that would help. While this is a past issue for most of you it is leading in the direction you are talking I assume. Holography encodes the information in a region of space onto a surface one dimension lower. 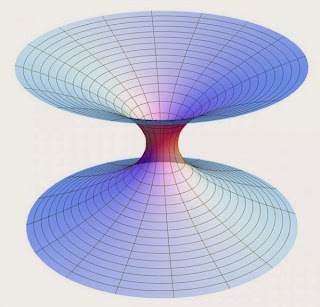 It sees to be the property of gravity, as is shown by the fact that the area of the event horizon measures the number of internal states of a blackhole, holography would be a one-to-one correspondance between states in our four dimensional world and states in higher dimensions. From a positivist viewpoint, one cannot distinquish which discription is more fundamental. The purpose of this note is to provide a possible answer to this question. Rather than the radical modification of quantum mechanics required for pure states to evolve into mixed states, we adopt a more mild modification. We propose that at the black hole singularity one needs to impose a unique final state boundary condition. More precisely, we have a unique final wavefunction for the interior of the black hole. Modifications of quantum mechanics where one imposes final state boundary conditions were considered in [6,7,8,9]. Here we are putting a final state boundary condition on part of the system, the interior of the black hole. This final boundary condition makes sure that no information is “absorbed” by the singularity. While there is no "apparent relationship(?)" between microstate blackhole production and blackholes what would make one think that particle collsions can be written as dual blackholes? It was a nice vacation and now being back, I see Lubos is clarifying some issues here for us to consider. The Gepner point demonstrates greater potential recognition of the brane world understandings and two dimensional views from a five dimenisonal developmentment for those who do not like such abstract adventures P.P. Cook helps to enlighten us on this subject. So have I done justice to the developing perspective, that we are now ready to take what what demonstrated, and move it to a greater format for those who will lead us laymen through the world of the abstract mathematics? 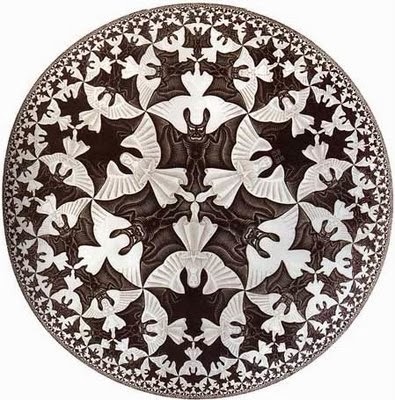 To help us enjoy what was mathematically unenduring for those not gifted to see the B field manifestaion, is a continuance of what we like to engage at higher dimensional perspectives. And really, it is all about imagery is it not? You must understand the state of thinking and dualistic nature that continues to force minds to engage the process, and this quest for wholeness, between two thoughts that are part and parcel of the same thing? Relativity and Quantum Nature. The larger circle is RElativity, and the smaller, the quantum nature. LQG and STring work from their respective positions. So do we select the basis for this model, and find that LQG and Strings are formulated on principals embedded in association with the blackhole topic? This throws light back again on a topic that has been shared more then once by such trends in thinking as Lubos exemplfies for us, and again directs our thoughts towards Lenny Susskind and Lee Smolin, in contrast to each other. I see people are teaming up appropriately, such as Cosmic Variance, and this of course has already been lead by Lubos and Peter's contrast to each other. Whether some like to speculate on co-joining for such comparsions on the validity of strings, versus no strings approach, as resolutions, had already been developed while we see this new means to develope, much as Brain Greene and others in ISCAP foundations principals. So of course onward and forward, we push the topic and the expertise for the layperson like me, that we see and continue to find, developmental processes appropriately gathering for future thoughts shared? Again too, we see Quantum Diaries has indeed served it's purpose more then once in what John Ellis and other's have shared, have open the doorway to how we see such developmental attitudes expanding in contrast to the larger circle of possibilties. 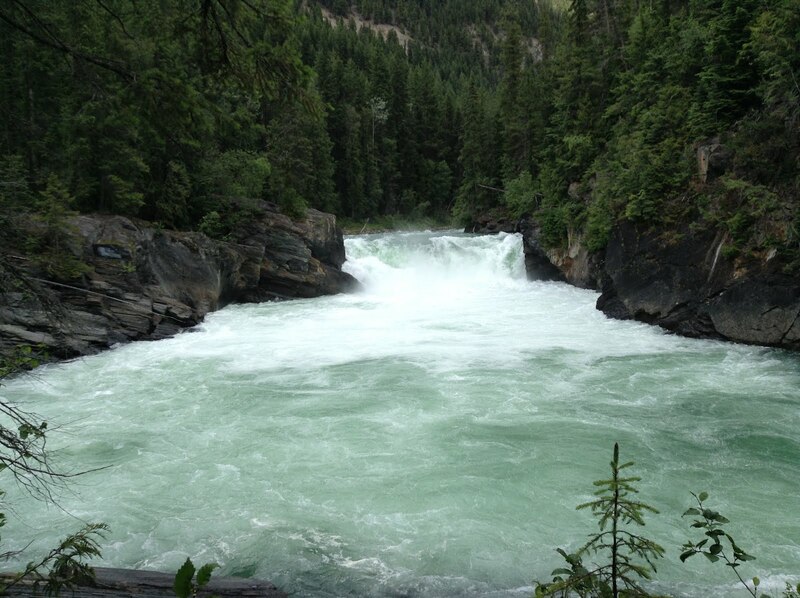 See John's latest entree and for me, hitting big objects and particle collisions still open the mind for the natural cosmic interactive processes ongoing in nature around us. Anyway back to the title of this post. I have some thinking here to do. If indeed we started to think about the point on the brane then what kind of simplification can be drawn so that those less enclined to such abstract thinking could find a greater potential to that dimensionnal thinking? (a) Compactifying a 3-D universe with two space dimensions and one time dimension. 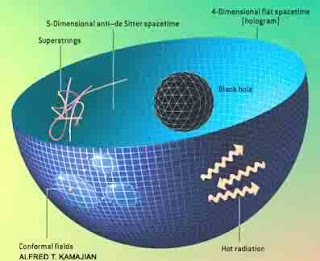 This is a simplification of the 5-D space­time considered by Theodor Kaluza and Oskar Klein. (b) The Lorentz symmetry of the large dimension is broken by the compactification and all that remains is 2-D space plus the U(1) symmetry represented by the arrow. (c) On large scales we see only a 2-D universe (one space plus one time dimension) with the "internal" U(1) symmetry of electromagnetism. Here such thoughts begin to form around the idealization of computer graphics imagery developed and leading in this idealization of this two dimensional screen. 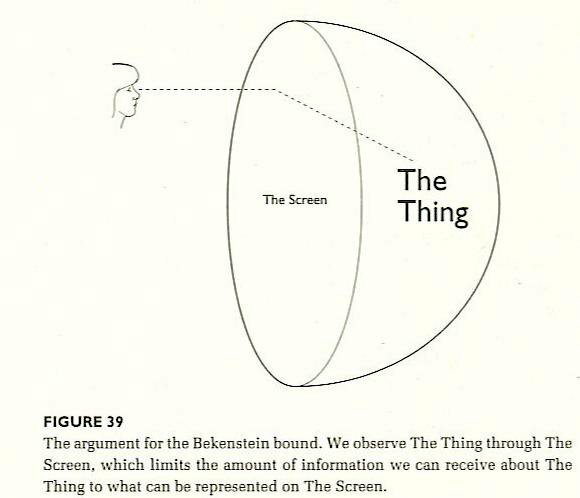 We see where the likes of Thomas Banchoff demonstrate where such new roads to the developing insight ot this imagery can be seen in Smolins views of the Bekenstein Bound, that we we now understand a greater potential exists in how we view the screen, and what is being described in the blackhole horizon? Let me show this image again, for greater clarity of what I mean. I've put together links for reference on the particular subject titled. If someone has others that they would like to add, please do. I will be placing a permanent link on the sidebar for reference. Hope its useful. Jan Ambjørn: Expert on dynamical triangulations who helped develop the causal dynamical triangulations approach to quantum gravity. Giovanni Amelino-Camelia: Physicist who developed the idea of Doubly special relativity, and founded Quantum-Gravity phenomenology. Abhay Ashtekar: Inventor of the Ashtekar variables, one of the founders of loop quantum gravity. John Baez: Mathematical physicist who introduced the notion of spin foam in loop quantum gravity (a term originally introduced by Wheeler). John W. Barrett: Mathematical physicist who helped develop the Barrett-Crane model of quantum gravity. Julian Barbour: Philosopher and author of The End of Time, Absolute or Relative Motion? : The Discovery of Dynamics. Martin Bojowald: Physicist who developed the application of loop quantum gravity to cosmology. Steve Carlip: Expert on 3-dimensional quantum gravity. Louis Crane: Mathematician who helped develop the Barrett-Crane model of quantum gravity. Fay Dowker: Physicist working on causal sets as well as the interpretation of quantum mechanics. 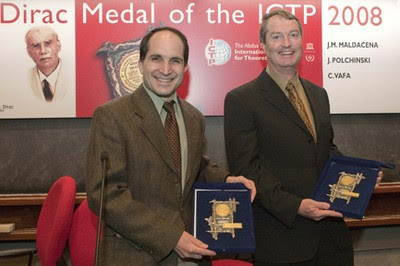 David Finkelstein: Physicist who has contributed much quantum relativity and the logical foundations of QR. Charles Francis: Mathematician who has developed a background-independent model of physics called Relational Quantum Gravity. Rodolfo Gambini: Physicist who helped introduce loop quantum gravity; coauthor of Loops, Knots, Gauge Theories and Quantum Gravity. 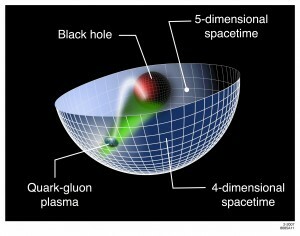 Gary Gibbons: Physicist who has done important work on black holes. Brian Greene: Physicist who is considered one of the world's foremost string theorists. James Hartle: Physicist who helped develop the Hartle-Hawking wavefunction for the universe. Stephen Hawking: Leading physicist, expert on black holes and discoverer of Hawking radiation who helped develop the Hartle-Hawking wavefunction for the universe. 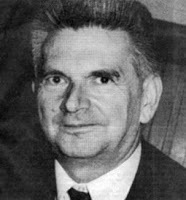 Friedrich W. Hehl: Physicist who developed the metric-affine gauge theory of gravity and published a Physics Reports review article about this subject. Christopher Isham: Physicist who focuses on conceptual problems in quantum gravity. Mark Israelit Physicist who worked on torsional Weyl-Dirac electrodynamics, quantum gravity and quantum cosmology (cosmic egg model, together with Nathan Rosen). Ted Jacobson: Physicist who helped develop loop quantum gravity. John Klauder: Physicist. Proponent of the theory called Affine Quantum Gravity. Renate Loll: Physicist who worked on loop quantum gravity and more recently helped develop the causal dynamical triangulations approach to quantum gravity. Robert B. Mann: Physicist who works on "Lineal" gravity i.e. gravity in lower dimensions and alternate theories within quantum field theory. Fotini Markopoulou-Kalamara: Physicist who works on loop quantum gravity and spin network models that take causality into account. Herman Nikolai: Physicist who works on quantum gravity and investigates Kac-Moody algebras as a candidate symmetry for supergravity theories and M-theory. Roger Penrose: Mathematical physicist who invented spin networks and twistor theory. Jorge Pullin: Physicist who helped develop loop quantum gravity, coauthor of Loops, Knots, Gauge Theories and Quantum Gravity. Carlo Rovelli: One of the founders and major contributors to loop quantum gravity. Lee Smolin: One of the founders and major contributors to loop quantum gravity. Rafael Sorkin: Physicist, primary proponent of the causal set approach to quantum gravity. Andrew Strominger: Physicist who works on string theory. Thomas Thiemann: Physicist who works on loop quantum gravity. Frank J. Tipler: Mathematical physicist who maintains in a 2005 paper published in Reports on Progress in Physics that the correct quantum gravity theory has existed since 1962, first discovered by Richard Feynman in that year, and independently discovered by others. Intrinsic to this theory of quantum gravity are certain boundary conditions, which includes an Omega Point final cosmological singularity. Bill Unruh: Canadian physicist engaged in the study of semiclassical gravity and responsible for the discovery of the so-called Unruh effect. Robert Wald: Leading physicist in the field of quantum field theory in curved spacetime. Anzhong Wang: Physicist, major contributor to Horava-Lifshitz gravity; String theory and applications to cosmology. Edward Witten: Leading mathematical physicist, does research in string theory and M-theory. Richard Woodard: Physicist, major contributor to canonical, perturbative, and finite infrared quantum gravity; applications to cosmology. A pessimist might say that combining string theory and loop quantum gravity is like combining epicycles and aether. http://www.theory.caltech.edu/people/patricia/test/Einstein3.htmlSolving Relativity in Three Dimensions. Finally, string theory started out as a generalization of quantum field theory where instead of point particles, string-like objects propagate in a fixed spacetime background. 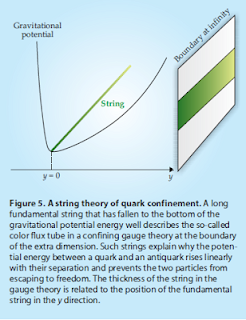 Although string theory had its origins in the study of quark confinement and not of quantum gravity, it was soon discovered that the string spectrum contains the graviton, and that "condensation" of certain vibration modes of strings is equivalent to a modification of the original background. LQG does not have this feature to describe point particles, where a one dimensional string includes gravity. The numbered points are connected to deeper explanations. Current theories of gravity are based on the geometric curvature of space. Current theories of other fundamental forces in the universe are 'quantum field theories', where particles pass other particles back and forth among themselves to interact. Quantum gravity is the field of theoretical physics attempting to unify the subjects of Quantum mechanics and General relativity. Much of the difficulty in merging these theories comes from the radically different assumptions that these theories have on how the universe works. 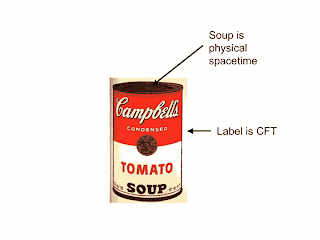 Quantum mechanics depends on particle fields embedded in the flat space-time of either Newtonian mechanics or special relativity. 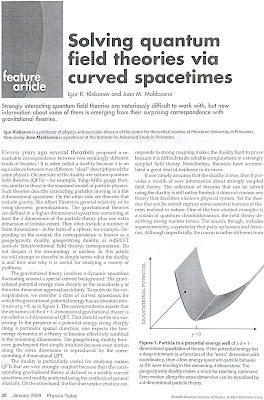 Einstein's theory of general relativity models gravity as a curvature within space-time that changes as mass moves. The most obvious ways of combining the two (such as treating gravity as simply another particle field) run quickly into what is known as the renormalization problem. Gravity particles would attract each other and if you add together all of the interactions you end up with many infinite results which can not easily be cancelled out. This is in contrast with quantum electrodynamics where the interactions do result in some infinite results, but those are few enough in number to be removable via renormalization. observations which would provide any hints as to how to combine the two. that it is not known if quantum gravity will be a simple and elegant theory. The Quantum Gravity Concept Map is a highly experimental work: it's goals are to help the author organize his own understanding of the subject, and to test the hypothesis that html is a natural language for the construction of a concept map. This is known as the Planck mass, after Max Planck, who noted in 1900 that some such mass would appear naturally in any attempt to combine his quantum theory with the theory of gravitation. The Planck mass is roughly the energy at which the gravitational force between particles becomes stronger than the electroweak or the strong forces. In order to avoid an inconsistency between quantum mechanics and general relativity, some new features must enter physics at some energy at or below 1019 proton masses. (Weinberg 1981, p. 71). The fact that Weinberg takes such liberties with history in this quotation is evidence of the need to describe the real historical circumstances in which the Planck mass arose. As we saw, when Planck introduced the mass (ch/G)1/2 (~ 1019mp) in 1899, he did not intend to combine the theory of gravitation with quantum theory; he did not even suppose that his new constant would result in a new physical theory. The first "attempt to combine the quantum theory with the theory of gravitation," which demonstrated that "in order to avoid an inconsistency between quantum mechanics and general relativity, some new features must enter physics," was made by Bronstein in 1935. That the Planck mass may be regarded as a quantum-gravitational scale was pointed out explicitly by Klein and Wheeler twenty years later. At the same time, Landau also noted that the Planck energy (mass) corresponds to an equality of gravitational and electromagnetic interactions. Theoretical physicists are now confident that the role of the Planck values in quantum gravity, cosmology, and elementary particle theory will emerge from a unified theory of all fundamental interactions and that the Planck scales characterize the region in which the intensities of all fundamental interactions become comparable. If these expectations come true, the present report might become useful as the historical introduction for the book that it is currently impossible to write, The Small-Scale Structure of Space-Time. The struggle to free ourselves from background structures began long before Einstein developed general relativity, and is still not complete. The conflict between [B]Ptolemaic and Copernican cosmologies[/B], the dispute between Newton and Leibniz concerning absolute and relative motion, and the modern arguments concerning the `problem of time' in quantum gravity -- all are but chapters in the story of this struggle. I do not have room to sketch this story here, nor even to make more precise the all-important notion of `geometrical structure'. I can only point the reader towards the literature, starting perhaps with the books by Barbour  and Earman , various papers by Rovelli [25,26,27], and the many references therein. String theory has not gone far in this direction. This theory is usually formulated with the help of a metric on spacetime, which is treated as a background structure rather than a local degree of freedom like the rest. Most string theorists recognize that this is an unsatisfactory situation, and by now many are struggling towards a background-free formulation of the theory. However, in the words of two experts , ``it seems that a still more radical departure from conventional ideas about space and time may be required in order to arrive at a truly background independent formulation.